Thanks to its innovative concept of merging a classic video game with a TV series, Quantum Break, the new game from Finnish developer Remedy Entertainment was hotly anticipated ever since its announcement in 2013. A PC version of the game is also being released at the same time, but our review is based solely on the Xbox One version. However, we hope to quickly provide you with videos of the PC version to satisfy those of you who crave high resolutions and framerates. Before we delve into the review, seeing as Quantum Break’s story constitutes a large part of the game, very few elements of the story will be revealed in this review and will mainly be confined to the very beginning of the game. In the case where it is necessary to bring up some story elements, we will give you ample warning in the text so you can avoid any spoilers. You can also watch, if you have not done so already, the preview videos put together by Driftwood which are included in this review. Now that the above warnings are out of the way, let’s commence our time-travelling journey. Note: The full translation wouldn't have been possible without Alimokrane, so many thanks to him for his hard work. So to begin, if you don’t want to know anything about the game’s story, you can jump straight to the second part of this review. 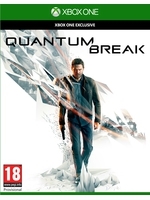 Quantum Break begins with Jack Joyce (Shawn Ashmore) returning to the fictional city of Riverport, a city which was on the verge of bankruptcy before the arrival of Monarch Solutions, a rich corporation at the forefront of technology. Upon its arrival, Monarch promised to save and reinvigorate the city with its many investments, yet as the years passed, its presence at Riverport became increasingly unwelcome by the city’s inhabitants. The game starts in the middle of a protest led by University students opposing Monarch’s decision to demolish a century’s old library after it had destroyed the city’s World War II remnants to build a research centre, and demolished the city’s central station only to replace it with “Monarch Tower” - a symbol of the corporation’s power. For some inhabitants, the destruction of the library was the last straw. Invited by his childhood friend Paul Serene (Aidan Gillen) whom he has not seen for years, Jack Joyce doesn’t know yet the reason he’s been invited back to a city he has left years ago. Soon, however, he will discover what is happening at the university and the role that his brother William (Dominic Monaghan) plays in all of this. Following an experiment which has gone horribly wrong, Jack and Paul are exposed to a high concentration of Chronons - an element essential to the function of a time-travelling machine. Everything changes at this particular moment and the two men quickly realise that they are now able to manipulate time in different ways. With Jack in our control, we attempt to escape Monarch’s security forces by making use of all sorts of conventional weaponry. After several ambiance-building gameplay segments which are interspersed with gunfights during which we discover some of Jack’s time powers, the first act of the game concludes by introducing us to an essential aspect of the game: “Junctions”. During these short phases of the game, you are given control over Paul Serene who has the ability to see the future and you are given the option to choose between two completely different futures. However, don’t think for a second that the choice is going to be easy and straightforward. In Quantum Break, there is not necessarily a good/bad or right/wrong choice and any decision taken will influence the outcome of the game and the TV series. Indeed, some choices could have drastic effects. For example [Spoiler alert! ], at the first junction, you can chose to protect the interests of Monarch and therefore execute all witnesses of the incident. This will protect the secrets of Monarch but leads to the explosion of anger in the public opinion. The other choice is less violent and allows you to manipulate the media and public opinion in order to put the blame of the incident entirely on Jack Joyce who, as a result, becomes a fugitive on the run but is given access to invaluable information about Monarch. A side note here: As is the norm with player choice based games such as those made by Telltale, you are given the opportunity to see the percentages of what other players and friends have chosen at these junctions. As you can imagine, the story occupies a very important part of the game and we didn’t expect any less of of Remedy especially after Alan Wake which kept us hooked until the end with its story. Here, Remedy pushes storytelling and intrigue even further especially with the junction choice mechanic which not only influences the game but also the TV show segments. These choices are far from being insignificant as certain characters are sometimes completely removed, consequently changing the story. During the adventure, you will also come across quantum echoes in the form of objects which you can manipulate. These echoes will change the TV episodes as well and are a good addition even though their effect is not as big as the junction choices. Several story branches are therefore possible but it is important to note that not everything changes. For instance, if some choices are going to drastically change Paul Serene’s behaviour, several scenes in the game remain more or less the same which makes sense. Therefore, the game acts will be modified in substance but not in form and you will play in the same environments regardless of your choices. Having said that however, depending on your choices, the environments will exhibit some changes at certain points but we won't spoil these and let you discover them for yourself. The last thing we want to touch upon with regard to story is that after completing the game twice by making different choices at the junctions, the ending was always the same. Quantum Break has therefore a single ending which, while answers some questions, leaves the door open for a potential sequel. Now let’s move on to another important aspect of Quantum Break: the gunfights. At first sight, it may appear that what we have on our hands is a classic third person shooter complete with over the shoulder view and a smart cover system when approaching walls and other sorts of cover. However, you will never play Quantum Break as you would play a game like Uncharted or Gears of War. You will never remain in one spot, partly because the AI always tries to force you out of cover but also because the heart of the combat system lies in the use of the several time powers at your disposal. In total, you have access to 6 different time powers and though the combat starts as a classic third person shooter, the game switches dimensions quickly as you progressively gain these time powers. Therefore, making use of these time powers will completely change your way of playing the game. In addition, the more you master these powers, the more the gunfights are transformed into an enjoyable and perfectly choreographed spectacle. Rare and possibly non-existent are these moments in games of this genre these days, at least not since the days of Max Payne which allowed us to jump in bullet time in all manner of awesomeness. Even though, enemy variety is a bit lacking, the types of enemies present all have their own characteristics and will require the use all 6 time powers to defeat them, at least in hard mode. In fact, the game is not too difficult on Normal mode and even if that poses a challenge, there is always an easy mode to welcome you with open arms. Your first time power is “Time Vision”: by pressing on the “Y” button, any enemies and explosive objects are highlighted but be aware that this power is deactivated the moment you start moving. “Time Stop” is the next power and it gives you the option to create a bubble where time is frozen. This is ideal to imprison an enemy in, you then fire bullets into the bubble which will hit the enemy as soon as the bubble unfreezes. Then enter “Time Dodge”, a very handy power that allows you to dash/teleport a few meters in order to reduce or increase the distance between you and your enemies. By holding down the aim trigger at the end of “Time Dodge”, a derivative of Remedy’s much loved bullet time called “Time Focus” is activated slowing down time and giving you a few seconds to calmly adjust your aim. Jack also has a “Time Shield” power allowing him to protect himself from enemy attacks and to recover some health. The bubble created by this power deflects projectiles and even enemies. The last two powers acquired during the adventure are: “Time Blast”, a kind of explosion which traps nearby enemies and “Time Rush” which allows our hero to move very quickly by freezing time around him. When approaching an enemy, a contextual action is then activated to trigger a hand-to-hand finishing move. As you progress through the game, you will find different items to pick up and some rather nice references to Alan Wake. Some of the things you will find are the quantum echoes described above, which affect the TV show segments. Others include computers which simply give you access to emails containing fairly detailed discussions between the various protagonists. This is a common way of giving the player more story details without forcing it upon those who are not interested. This will probably not please everyone but we can not blame Remedy for wanting to make the story more credible and develop the relationships between the various game characters. Other elements to discover are called Chronon sources. These give Jack the opportunity to enhance his time powers. You can for example increase the range of the time vision power, improve the strength of the time stop so that the bubble absorbs more bullets before unfreezing, or reduce the charging time of the time blast power. To find these sources, you will need to keep an eye on the time vision icon on the screen, which will flash yellow when in their proximity. You will then need to activate the time vision power and make use of the small radar at your disposal to find these sources. During the quieter segments of the game, as was shown to you by Driftwood and his phobia of ketchup during the live streams, many environmental objects react to the character's actions, bullets or time powers used. Sometimes you have to shoot destructible objects visible through the time vision power in order to bring down a beam, for example. Then you can "rewind" time to put objects in place in order to pass on this beam before it collapses, but be aware, this effect does not last very long. You will also cross some passages where time is completely altered; where objects are frozen, then accelerate back and forth to their original position. The effect is in many cases very impressive and these platforming segments add a good variety regardless of the fact that the challenge is never very high. Quantum Break’s levels are generally very well designed and built, particularly the placement of covers in the gunfight segments, but one can’t help but be a bit disappointed with the lack of enemy variety. Almost everything is spectacular in Quantum Break but the lack of variety is sometimes felt. The same observation applies to weapons. Despite quite a big selection of pistols, different types of rifles (improved, tactical, assault rifles ...) and other weapons (rifles, semi-automatic, machine guns), we would have liked to see more variety and originality especially in the weapons that Monarch enemies are using. We have already addressed the technical aspect of the game in our two previews and even though we do not have much to add, it is still important to note that the game looks quite impressive on several occasions. Whether during that memorable scene already presented at Gamescom where we see the time pass at full speed or during the many visual distortions visible when using the different time powers, or whenever the beautiful lighting and PBR are exhibited at their full potential, Quantum Break is a joy to look at. This is in addition to the physics engine which clearly cannot catch a breath with the amount of destructible objects present in the environment which add a lot of dynamism to the gunfights. As the debates about the game’s resolution rage in forums all over the world thanks to the pixel counting enthusiasts, there is no denying that Remedy managed to make maximum use of the hardware offered by the Xbox One. So yes, some textures are not very detailed, the LOD is sometimes fickly and the filter used is not always very pleasant to look at, but the game runs smoothly at all times and if Remedy had to make some technical compromises to get there, we can only approve. We have not had a look at the PC version yet, but we hope to provide you with some gameplay videos as soon possible to see whether or not the PC version offers any noticeable visual upgrade. In the audio design department, Remedy has done an excellent job on the weapons and various explosions during combat. The music is fairly subtle but the themes composed by Petri Alanko, the composer of Alan Wake, are excellent. The voice acting is superb and the lip synchronization work is undoubtedly among the best done in the genre. Now, let us end our review then with a few words about the length of the game. In keeping with the genre, Jack Joyce’s adventure is composed of 5 acts and it took us a little over 7 hours in normal difficulty to complete it. If you add the TV series into the mix and seeing that every act is linked to a TV episode lasting about 25 minutes, you should complete the game after roughly 9 hours. Of course, depending on your desire to find the various collectibles and chronon sources, your play time will vary. We would have loved if the game was longer in order to experience more of this universe, but the game has a good replay value and playing again to select the other choices is interesting in order to see the story from different angles. After the game is completed, you can revisit the 5 acts as you wish in order to go hunting for more collectibles or indulge in the game’s gunfights again to master the different time powers on offer. Microsoft’s first exclusive of 2016 is something to be proud of and looks great. Although some technical sacrifices will not please the most demanding, we can only admire the work done by Remedy. The game’s objects fly, freeze and deform in real time because of the different time powers and the result on screen is stunning. The effective story and the few twists that spice it up are also something to be praised, as should the overall performance of the actors, both during the game and the live episodes. The game, however, is not without its faults. Beyond the lack of enemy variety and sometimes repetitive segments of the game which are legitimate issues of course, the most disappointing aspect for us was the length of the game. Even though replaying the game is indeed very enjoyable and for once justifiably so, we would have liked a few more sequences, and other powers to manipulate time. Having said that however, what still remains with us is a very positive appreciation of the game and a feeling that we have played something very unique. Yes, the game borrows some gameplay mechanics from elsewhere, but Quantum Break also retains a strong identity and is a game we will remember for a long time. + A unique game in the genre. + The time powers we can use in the gunfights. + The voice acting. Excellent in both the game and TV series. + A simple story on the surface but is much deeper than it appears. How long did it take you to beat the game? 6-12 hours maybe? 7 hours of gameplay in normal mode plus 4 live action episodes that last 25 minutes each. Yikes! Don't know if that's worth the $60 or not. Anyways, keep up the good work! Hi guys ! thanks for the amazing work as always. I was wondering, do you have any uncut and uncommented vids of the final version of this game ? The few I've tried in both preview articles are either commented montages or stream replays (so commented too, logically). It's not that I don't like to hear your thoughts :D But I usually like that there is also "untouched" captures to watch as the top-notch quality of your vids makes it a good opportunity to get a feel for the vibe of a game as if it was running before me. Not before April 5 unfortunately. Jesus, that is not what I wanted to read. I really thought we would be dealing with at least 10 hours. No way am i paying full price for 7 hours. It's annoying that MS have locked this game to the Windows Store, ensuring no one will buy it. Would have got it cheap on a Steam key site but no Steam version. I have a XO too but that's not even an option in this case, i'm done with 30FPS console games. Even the Sega Saturn and PS1 had some 60FPS games in the 90's (Virtua Fighter 2 was smooth as butter). 30FPS is totally unacceptable in 2016. Length is a disappointment but this just looks so refreshingly different that i just cant resist it.. Played Rise of the Tomb Raider on Survivor right away as well. 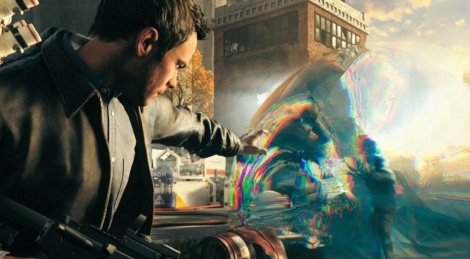 Remedy's Quantum Break possesses a level of rendering technology that is supremely impressive. This game is doing things we've not seen in a mainstream title before. John reveals all. Bah is it really that short? - first I thought it's an April's joke, damn. I've been hearing 10 hours from other reviewers. I guess it's how you play and what difficulty you play on. After seeing the review on Metacritic, Jeff Gertsman needs to find another career. That dude is almost always the lowest score to any game on the site. Funny, soon as I heard live action sequences, I knew that either the game or the game length would get sacrificed. Not that hard to figure out since you have to pay these actors and take time to shoot the live sequences. Sad part is that no one will remember those unless it becomes a real movie. I like Remedy and their desire to push the envelope. Shame since I was hoping to play this day one. I will wait for the price to drop. I'm not suprised at all he gave QB the lowest score since he's made it clear many times before that he is sick of third person shooters. I'm afraid he will be this harsh on Uncharted 4 as well. And this is why I'm waiting for it to drop in price a bit. I'm sure it won't take too long. Just bought trackmania to play until then. To be fair, I felt from very little to no enthusiasm from the GiantBomb's guys on their E3 2015 Sony Press Conference livestream. I was watching all kinds of reactions from that epic conference and those epic announcements and the GiantBomb's guys were very depressing, it was almost as if they were working in a job that they hated it - specially Jeff Gertsman. I also remember them making ridicule of a lot of games for no reason, not the type that is funny, but rather the type that is demeaning/degrading the games. I don't follow GiantBomb, at all, but that was the impression I got. And of the tens of livestreams I watched, they were the only ones that acted like that. If Jeff Gertsman hates or is sick of Third-Person Shooter's games, then he shouldn't be reviewing or even covering this type of game since he won't be able to be objective and unbiased, which a professional should be. I'm mentioned that GiantBomb livestream because the impression I got is that Jeff Gertsman is tired of or disillusioned with games in general, not just a specific genre. I haven't read his Quantum Break review, but I have seen this argument being discussed many times before. It's okay to cover a genre you're not a fan of - that actually gives different perspectives from those that do like that genre's games and would most likely only praise the games. But if someone strongly dislikes or hates a type of genre, then he or she shouldn't cover that genres' games since they mostly likely will not be professional. I hope this does not seem like an attack on GiantBomb or Jeff Gertsman himself, it's just that the one time I watched a GiantBomb livestream, they were very depressing in an event that created a huge ammount of excitement, making ridicule of games for no reason and seemed like they didn't want to be doing what they were doing, so a complete lack of interest and disrespect on their part in my opinion. I should point out that in that livestream Jeff Gertsman was completely different than the other times I saw him in the Bonus Round with Geoff Keighley, where he looked genuinely interested in games. But that was many years ago, so who knows what happened to him since then. Still, if he got tired of it all, then he should find a new profession or just oversee things as an administrator. And not cover the types of games he is sick of, since nothing good can come out of that for both the game and even himself as a professional. Not being overly excited and swallowing everything the big companys say and show at E3 seems like a very healthy approach. If it is true however that Jeff doesn't enjoy 3rd person action games anymore then I agree that he is the wrong person to review that type of game. I don't have a problem with not being overly excited, but I do have a problem with people forcing themselves into doing things they have no interest or hate, and then making ridicule of things for no reason as if to make the time pass faster or to not be as bored. If you want, you can watch the entire GiantBomb livestream of the E3 2015 Sony Press Conference on Youtube like I did (link below), I only did watch everything because it was quite interesting seeing people like that covering arguably the best E3 or games conference of all time. I also don't know why you'd to write a six paragraph comment critiquing a review that you haven't even read. Just seems kind of odd. Why was it disappointing to you? I'm actually curious. If he has no invested interest in big titles that had forever being rumoured and finally getting announced then it's pretty obvious why it would be disappointing.